Custom Domain Name for Google Sites is quite easy to add and there are various ways to add your favorite .com domain name to point towards your Google Site. The question how to add a Custom Domain Name for Google Sites is asked by a visitor. she has searched many pages and basically clicked wrong places (including Ads) to get enough confused. Setting up a Custom Domain Name for Google Sites is very easy and there are several ways to add Custom Domain Name for Google Sites in various situation. Important point regarding adding Custom Domain Name for Google Sites is your need and situation. If you already own a domain name, the situation is different and if you want to buy a domain name through Google to setup a Custom Domain Name for Google Sites, add a subdomain as custom domain name or use an already owned domain and add as Custom Domain Name for Google Sites. For our topic adding a Custom Domain Name for Google Sites, has some small things. One of them is the domain name should not be sounding like any product of Google or brand name of Google. If you have not purchased the intended Custom Domain Name for Google Sites, you can buy it through Google. 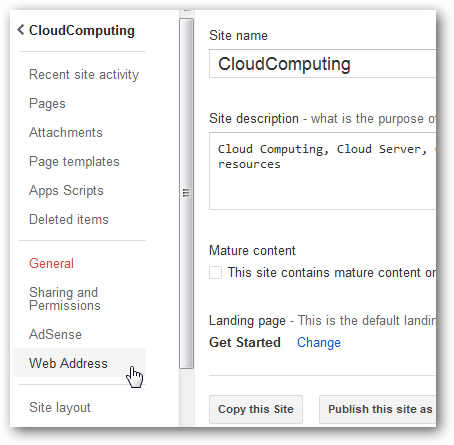 Adding a Custom Domain Name for Google Sites through Domain Register’s control panel : If you add the url as content to point towards that Google Site, it can be easily pointed. However, not all control panel has this feature. So the final step is nothing but to change the CNAME record to setup Custom Domain Name for Google Sites. For this last step to setup CNAME to get Custom Domain Name for Google Sites follow the first part of this tutorial. If are using other control panel, adding ghs.google.com as CNAME as per their described way (like for cPanel, Plesk etc.) will give you the way to add your Custom Domain Name for Google Sites. This Article Has Been Shared 1782 Times! Tips For Maintaining Security of Data in the Cloud will help specially the naives to cloud storages like iCloud, Dropbox, Amazon S3 or Rackspace Cloud Files. 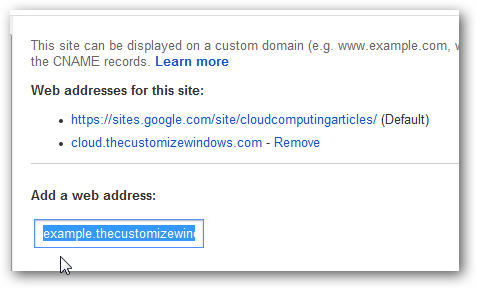 Cite this article as: Abhishek Ghosh, "Custom Domain Name for Google Sites," in The Customize Windows, March 13, 2012, April 18, 2019, https://thecustomizewindows.com/2012/03/custom-domain-name-for-google-sites/.